Each patron may purchase up to three individual bottles of 2017 Concealed Darkness. 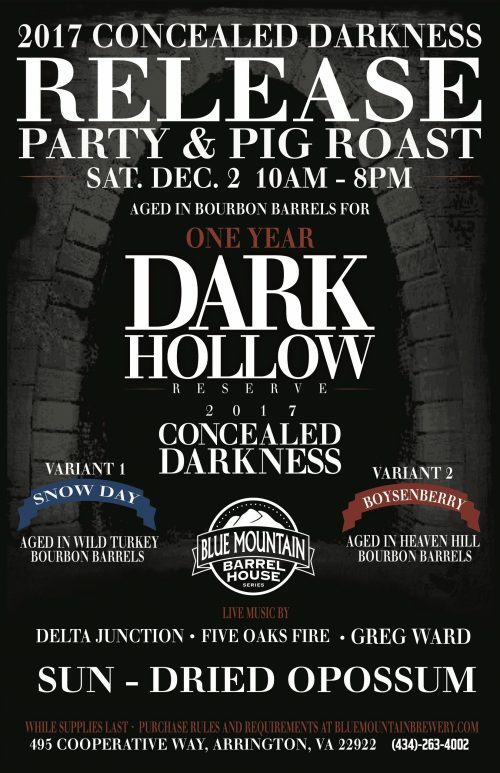 If three bottles are purchased, you have the option to buy a 2-pack of Snow Day Stout Concealed Darkness Variant and a 2-pack of Boysenberry Stout Concealed Darkness Variant if you so desire. A vertical 3-pack of 2015, 2016 and 2017 Concealed Darkness will also be available for purchase. Patrons who purchase the vertical 3-pack may also purchase a 2017 3-pack, but only those who purchase the 2017 3-pack will have the option to buy the variants. **Supplies of CD 2017, CD 2017 Variants and CD Vertical 3-packs are limited.